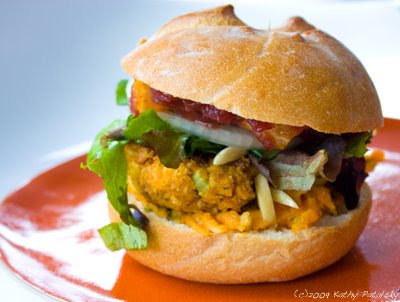 Recipe: "Thanksgiving in July" Backyard Burgers. Vegan. Burger season is almost upon us, and for me, that means pulling out a few recipes and "burgerizing" them. 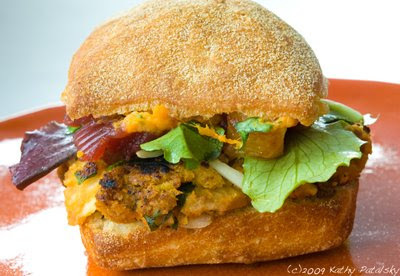 This time I decided to take my crowd-pleasing recipe for Sweet'n Savory Sweet Potato Pita Pockets and turn them into a delicious vegan burger - fit for a stove top skillet, or hearty enough for a backyard BBQ. Get tan for seitan. Seitan, pictured right, is a high protein, lean, meaty vegan ingredient made from vital wheat gluten. It is perfect for those sun-filled backyard barbecues. You can lay back, work on your tan, sip a frozen lemonade all while some seitan skewers heat up the grill. Seitan is a strong vegan protein that even die-hard-meat-eaters will love (if they humble themselves to try it.) Thus, sticking a nice helping of sauteed seitan in these burgers was the perfect way to "wheat-meat" them up! Thanksgiving, but not. I love the flavors of Thanksgiving, but sometimes with all the stressful planning, dinner prep and family coordinating it's hard to kick back and enjoy the food. Thus, here is a way to indulge in the healthy and delicious flavors of Thanksgiving without all the extra holiday hub-bub. 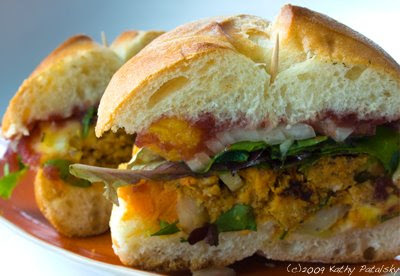 This burger combines all those holiday favorites: sweet potatoes, stuffing, tangerines, cranberry sauce, almond-greens and some hearty protein from seitan (Tofurkey IS made of seitan). Healthy Holiday. 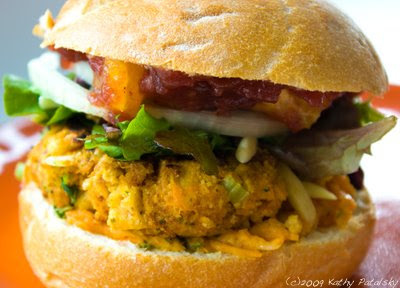 And FYI, the foods we eat at Thanksgiving which are represented in this burger, are incredibly healthy. More info. 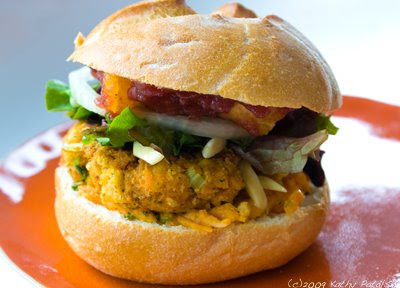 *hearty buns work better than soft buns for this burger. Add cooked sweet potato, hummus, parsley, onion, olive oil, tangerine juice, maple syrup, salt and pepper. Mash and mix well. Re-heat to serve. In hot skillet, quickly saute 1 1/2 cups raw seitan, with a drizzle of oil. Fold seitan and sweet potato mash into stuffing mix until desired consistency is achieved. Add liquid to loosen stuffing mix if needed. Form into patties and cool in fridge until ready for grill or skillet. Grill about 3 minutes each side. Side of sweet potato fries? OK, maybe not. But my Vegan Cole Slaw would go great on the side! 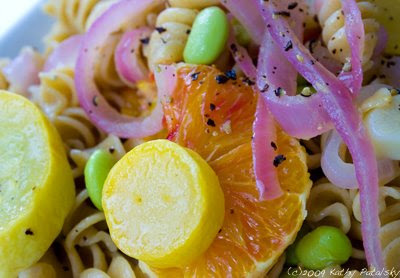 Recipe: Squash 'n Spirals Summer Pasta. Sun-Yummy. Squash is a healthy and delicious veggie. It is incredibly easy to prepare. Low in calories and rich in nutrients, squash is the perfect 'diet' veggie. Protein Packed Pasta. 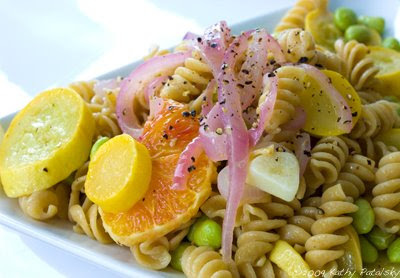 This recipe for Squash 'n Spirals Summer pasta is high in fiber, rich in nutrients and high in protein thanks to the addition of delicious green soy beans. 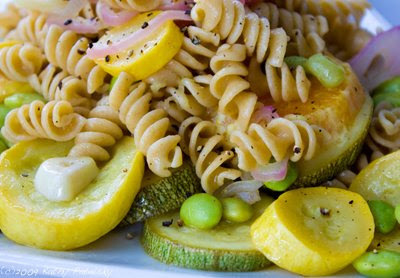 Whole wheat pasta, fresh garlic, red onion, lemon and orange flavors are the perfect compliment to thick-cut summer squash rounds. Squash it! Squash your fear of squash once and for all. You'll be amazed at how easy to clean, cut and cook squash is. 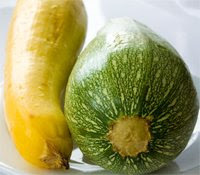 And since squash has a mild taste and absorbs flavors well, it goes with many different foods. 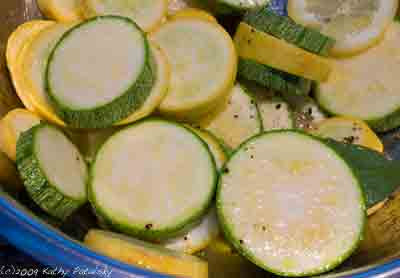 Put sliced squash, garlic, lemon juice, bay leaf, thyme, 2 lemon slices and 2 Tbsp olive oil in a large bowl to marinate. Add a few grinds of fresh pepper and coarse sea salt. Mix well, let sit for ten minutes. Boil water to cook pasta. Cook pasta and set aside in a large mixing bowl. Toss with 1 Tbsp olive oil. Steam edamame and add to pasta bowl. Toss well. Heat 1 Tbsp vegan buttery spread in saute or soup pan. Add squash mixture. Cook veggies until tender, but not mushy. Degree of doneness is up to you. When veggies are done, add a few grinds of fresh pepper and sea salt. Add veggies to pasta bowl and fold well. Do not mush squash though. Serve warm or re-add to soup pan and allow pasta to re-heat for five minutes. Serve with a lemon circle and fresh parsley for garnish. 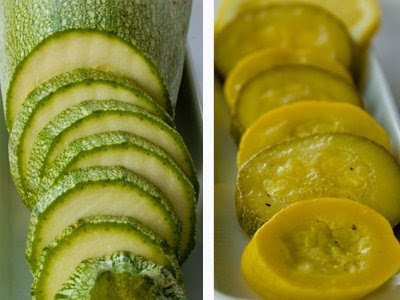 You should squash any hesitation you have about adding summer squash to your diet. Squash is a mild and delicious veggie that absorbs flavors very well and adds very few calories to a dish. Squash your Diet. One cup of squash only has around 15-40 calories, depending on the variety and size. 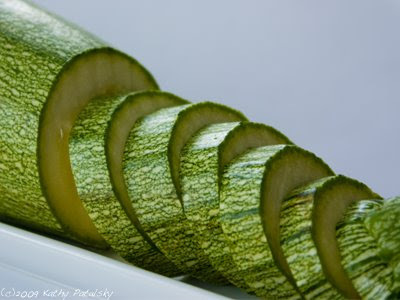 What a perfect veggie for keeping you satisfied yet keeping you well-nourished. Squash is a perfect diet veggie. Squash has a very high water content and is surprisingly rich in nutrients including manganese, fiber, folate, potassium and Vitamins A, K , B6 and C.
Squash Craving! You are dying to test out a squash recipe right? 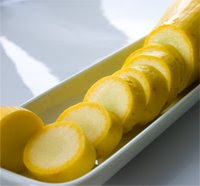 Well squash is delicious grilled, skewered, steamed, added to pasta or baked into a lasagna. Next up, I'll post an easy and nutritious squash pasta recipe. Cool Fact: Though considered a vegetable in cooking, botanically speaking, squash is a fruit (being the receptacle for the plant's seeds). 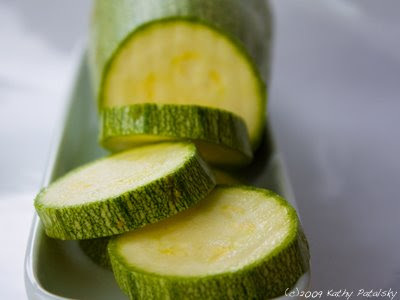 Slice squash into cubes or circles. Saute in skillet for a few minutes. Do not overcook. Bite should be firm, yet tender. 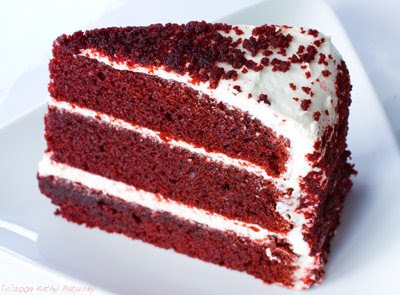 Vegan Red Velvet Cake: Red Mango Bakery. My Review. 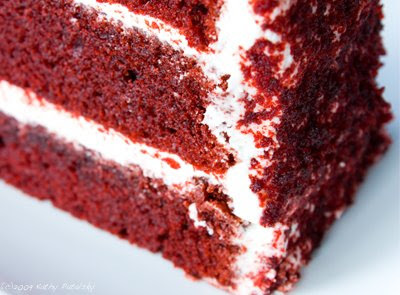 Red Mango Bakery in Brooklyn, New York makes a famous Vegan Red Velvet Layer Cake. It's a tall beet-red stack of fluffy cake and creamy snow white frosting. I don't know how they make it. But I'm just glad they do! Vegan Cake 2009. It's 2009, and vegan cake doesn't have to taste like cardboard and look like wheat bread. Most everyone loves cake. Even health-conscious, animal loving vegans. Let us all eat cake. Red Mango Bakery. They are wholesale only, though they do a few specialty orders. Incredibly friendly staff. I found their divine slice of red velvet heaven at The Bean Coffee Shoppe in the East Village NYC. Also on hand from Red Mango was a Peanut Butter Chocolate Cheesecake. It looked outstanding. Next extra special treat is going to be a slice of that! Vegan Bakery Finds. I am always thrilled when I find a new vegan cupcake, ice cream store, cake, pastry, doughnut or bakery. No I don't eat these treats everyday, but it's nice to know that they exist if I crave one. Deprived Vegan Brides Everywhere. As a bride who sadly didn't get to eat her own wedding cake, because there were no vegan bakers nearby, I am incredibly supportive of quality vegan baking companies that I come across. Red Mango is one of them. Shelf Appeal:Sometimes giant slices of cake can get ignored at places like The Bean. But not this one. 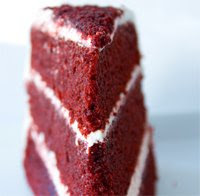 Standing tall, proud, and irresistible, this Red Velvet cake, proudly marked vegan, gets snapped up by patrons. With crumbly red bits sprinkled on top of the snow white frosting, how an a vegan NOT try this? I hope the 'vegan' sign doesn't deter non-vegan coffee patrons from checking out just how good a vegan cake can be. Taste Test: Is "Yum" a verb? How about "Mmmm"? Because you don't eat this cake, you Yum and Mmmm it. Really. It's that good. The cake is fluffy yet has a desirable dense quality. It's not too airy or moist. It really reminds me of wedding cake consistency. The frosting is outstanding. A little on the sweet side for my taste, but I guess for Red Velvet you have to go all out. Icing is creamy yet more of a sugar frosting that a 'creamy' frosting. The red crumbles on top are so fun. This cake has some serious sweet-sensational factor, yet it's amazingly not 'heavy'. I think the dairy-free-ness helps keep it easy to eat. 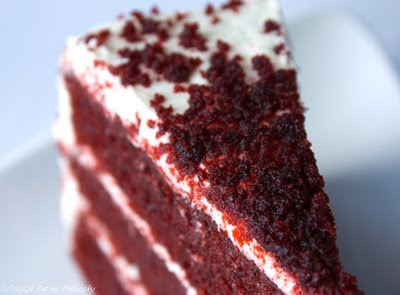 And FYI, it's not just me- the Yelp.com reviewers of The Bean all seem to mention the Red Velvet Cake! Price Check: Around $6 a slice. For the size, I think it's fair. And where else can you get this in a corner street coffee shop? 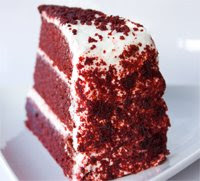 Get you latte, check your cell phone messages, sit in a comfy chair and eat Vegan Red Velvet Cake. Last Word: I wish Red Mango Bakery was around when and where I got married! That's the beauty of big cities like Los Angeles, San Francisco and NYC - you can always find someone doing something (like vegan cake baking) off-the-beaten-track out of passion. And eventually, if proven a success, it goes mainstream. Vegan wedding cake, Red Velvet Cake and PB Choco Cheesecake for all who desire it - is what I envision. Let them eat vegan cake! How Marie Antoinette 2009 of me. Melon 101: Recipes, Tips and Nutrition Facts! Bright beautiful round melons are a hydrating treat for everyone. Melons are low in calories and high in a few important nutrients like Vitamin C and potassium. But sometimes shoppers shy away from buying melons simply because of their size, weight and mystery of what is on the inside! Quick to Digest. It's true that melons are one of the most easily digestible fruits. 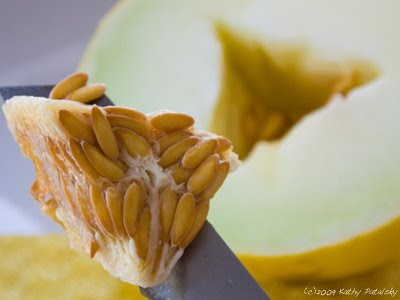 By the time melon hits your stomach, it is almost completely digested from chewing and saliva. Thus, a lot of food combining believers think that you should only eat melon alone. Myth or fact? I'll discuss. Many Melons. There are many varieties of melon. 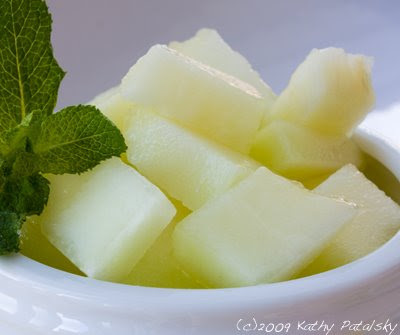 The most popular and common in the US are Honeydew, Cantaloupe, Casaba and Watermelon. Ahead, I'll discuss how to tell melons apart and a few tricks to pick out the best melon. 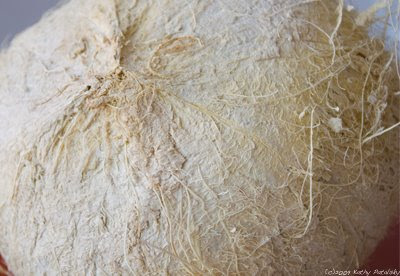 Casaba-trition. 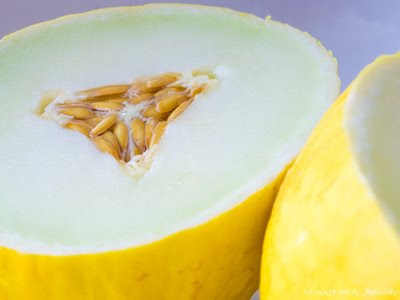 Casaba melon, pictured above, is high in Vitamin C, fiber, potassium and Vitamin B6. And it only has 46 calories per cup. Nice. Melons range in calories from 40-80 calories per cup, depending on the melon type and its degree of ripeness. Riper melons contain more sugar. In general, melons are high in fiber, Vitamin C, potassium, and a few B vitamins like B6. 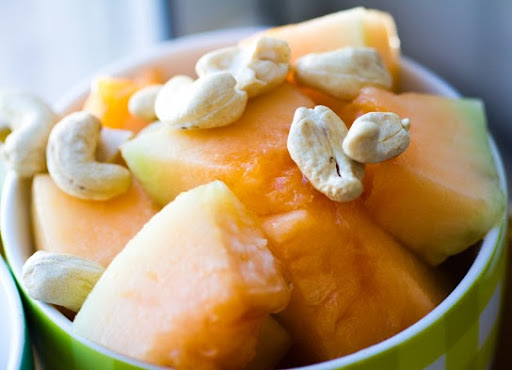 Cantaloupe melons are considered very nutrient-dense because of their high Vitamin A content. 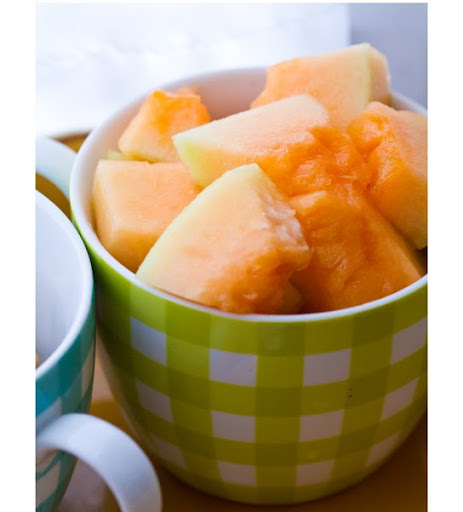 One cup on cantaloupe contains 120% RDA of Vitamin A. All that and only around 55 calories. 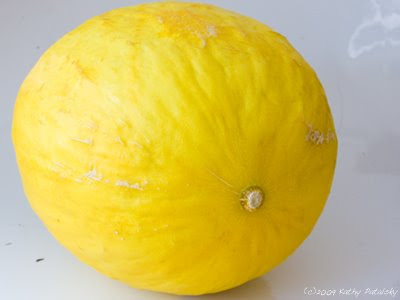 Casaba: Bright yellow rind, light whitish yellow on the inside. Seeds are easy to scoop out. Has a sweet pure flavor. Easy to add flavors to. Neutral sweetness. Very smooth and hard rind-a few creasing lines. Slightly oval shaped. 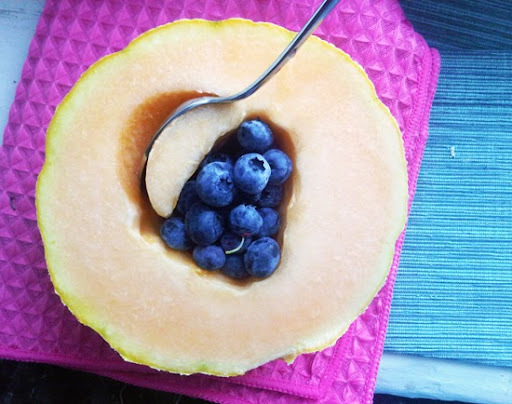 Cantaloupe: Rough criss-crossed tan rind. Becomes softer as it ripens. Inside flesh is bright honey-orange. Seeds are easy to scoop out. Sweet flavor with a very unique sweet accent all its own. Perfectly round. Watermelon: Rind is green with white lines. Smooth. Hard. The inside flesh is bright pink-red. Very watery and grainy texture. Very sweet, yet the high water content cuts the sweetness. Crisper bite than other melons. Seeds are embedded and tricky to remove before serving. Seedless options are available. Oval shaped. Exotic seedless watermelons are smaller and round. 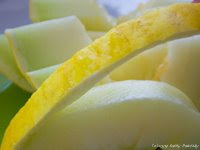 Honeydew: Whitish-green-yellow rind. Smooth and hard. 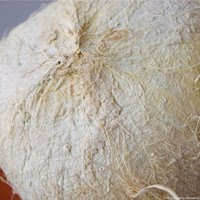 Inside flesh is whitish green. Very succulent and almost ripe-peach like when at its height of ripeness. If cut too soon it can be hard and lacking in sweetness. Seeds are easily scooped out. Delicious dessert-sweet flavor. Perfectly round. It's easy: Smell, listen, feel. Smell the melon. More aromatic smell is a ripe and flavor sign. Listen: Knock on the melon. A hollow sound is a good sign. 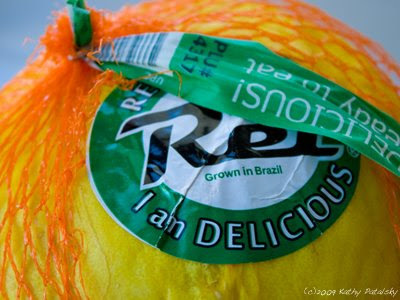 Feel: Feel the rind. Look for a nice firmness with a tinge of tenderness. Too hard or too soft melons should be avoided. "Melons are such a perfect food for humans that they require no digestion whatsoever in the stomach. Instead, they pass quickly through the stomach and move into the small intestine for digestion and assimilation. But this can happen only when the stomach is empty and melons are eaten alone, or in combination only with other fresh raw fruits. When consumed with or after other foods that require complex digestion in the stomach, melons cannot pass into the small intestine until the digestion of other foods in the stomach is complete. So they sit and stagnate instead, quickly fermenting and causing all sorts of gastric distress. "Source: Daniel Reid." The 'other side' anti-food combiners, say that our stomachs can handle just about anything and eating melon alone is not necessary. I see truth in both sides. 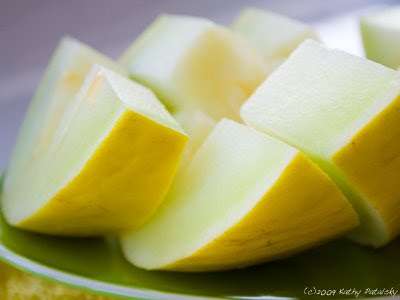 For optimal gastric comfort and efficiency I would say eat melon by itself or at least with other sweet fruits (like in a sweet fruit salad). But if you eat a few slices of melon at say a big buffet or event, don't freak out. The melon may not digest out of the stomach as quickly, but it will digest. The only time I could see a problem is if you are eating a big meal with a lot of melon. Then you will most likely experience some stomach discomfort that could have been avoided by not eating the melon. De-rind and cube, ball or slice melon. Add the juice of 1 lime to melon. Mix well. Top with a few sprinkles of course sea salt. 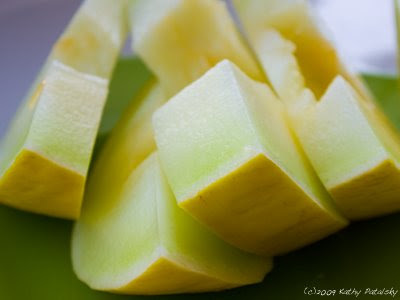 *Works best with sweet melons like honeydew. De-rinds and cube, ball or slice melon. 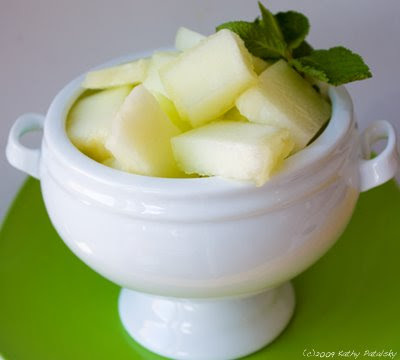 Add 3 Tbsp honey or agave syrup to melon in bowl. Plate and drizzle with a few teaspoons of olive oil. Chop 1/2 cup of fresh mint. In a large bowl toss melon with mint and a pinch of natural sugar or agave. Plate and garnish with mint sprigs. Add melon, 2 tsp cayenne and a drizzle of olive oil to a bowl. For spicy-sweet flavor add a few drizzles or a natural sweetener like agave. De-rinds and cube or ball melon. Add to skewers. A mix of melon varieties looks best. Sprinkle skewers with any of the above ingredients. $30/lb Mushrooms. Worth it or Worth Skipping? Plus Tips! I love perusing the mushroom section at Whole Foods. 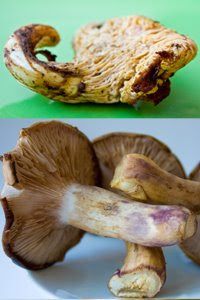 White button, shiitake and portobella are the typical varieties. But there's always a few exotic varieties in stock as well. Today it was Chanterelle and Blue Foot mushrooms. The shocker is usually the price tag of these mushrooms. Chanterelle and Blue Foot: $29.99 a pound. So I have to ask: Worth it or worth skipping? Lets take a look at the $30 prime suspects: Bluefoot and Chanterelle. Bluefoot. No blue feet here. But a blueish-lilac speckled stem is what gives this elegantly clean mushroom its name. Bluefoot mushrooms have an intense woody flavor and hold their shape quite well after a quick saute. Chanterelle. Ribbed and bright orangish-yellow. Resembles a giant piece if popped corn-with a long stem. Marshmallowy-looking. They cook up with an earthy flavor, less woody than the bluefoots. Incredibly aromatic flavor. $30/lb Mushrooms. What's a Foodie to do? This is a seriously controversial foodie situation! OK, believe it or not, you should not be shocked and deterred by the sticker shock of $30 mushrooms. 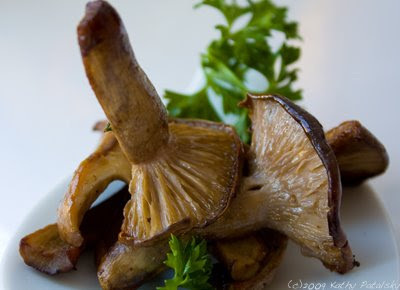 Mushrooms are incredibly light for their size, so if you can purchase them piece by piece-do it. Thanks Whole Foods. Look, you're not going to walk away with a pound of chanterelles-unless you are cooking a heavy duty meal for special guests-then maybe. 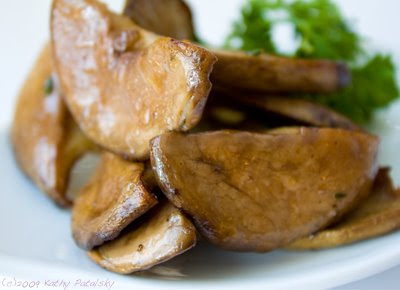 Indulge the mushroom connoisseur inside of you! The fabulous thing about pick-your-own mushroom sections is that you can buy a little bit and not spend a lot! Even with the $30 varieties. For example, I literally bought 3 large bluefoot shrooms and it cost around $2.50. Trust me, it was worth it. 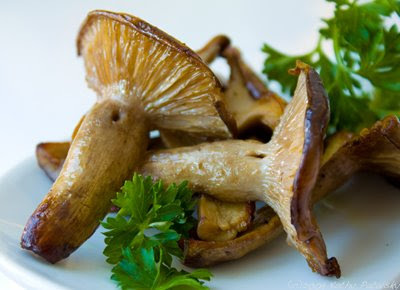 These mushrooms are so flavorful that just a few provide an intense flavor impact to a meal. A few chanterelles cost me around $3.50. Thus I had a very gourmet mushroom tasting experience for around $6. Michelin-Star quality Mushrooms. 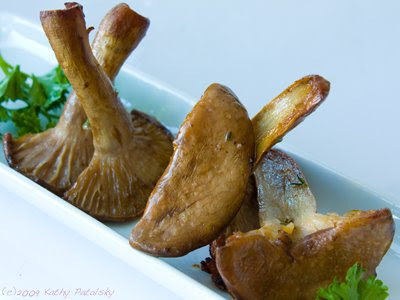 You'll easily find Blue Foot and Chanterelle mushrooms on the tasting menus of the most esteemed chefs. There is even a fine dining restaurant here in NYC called Chanterelle. Hen of the Woods 13. Cooking mushrooms is incredibly easy. The hardest part is the prep of cleaning and properly slicing the shrooms. Here are instructions for chanterelles and blue foots. Rinse the Blue Foots well. Gently dry. Blue Foots are naturally very grime-free, so scrubbing is usually unnecessary. I like to slice my Blue Foots right down the middle for a half-cut look. Sliced too thin and you will lose some of the thick-bodied texture of the shroom. For fat-free shrooms, steam them with a pinch of salt. For maximum flavor I like an olive oil saute. Saute in a pan with a tablespoon of olive oil, pinch of salt and pepper for about 5 minutes. I like to cover the pan as they cook to 'steam' cook the caps and seal in the moist flavor. You can even add some shallots or fresh herbs to the pan if you'd like. But eaten 'unseasoned', these mushrooms are delicious. Chanterelles are similar, but may require a bit more cleaning. I like to cook small chanterelles whole-no slicing. But the larger mushrooms I will slice into thin long strips. Simply saute lightly and they are done. And delicious. 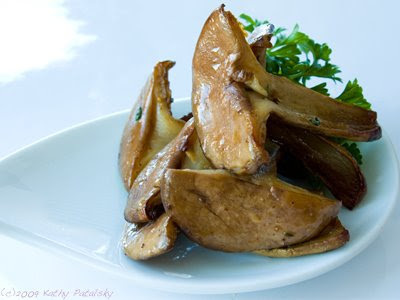 Do not overcook mushrooms or they will become chewy, rubbery and lose their moist texture. Don't forget that mushrooms are incredibly healthy. Here's another mushroom post to feed your mushroom curiosity. 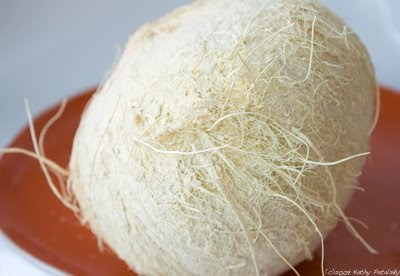 I found this ethereal-looking white coconut on my last trip to Essex Food Market here in NYC. 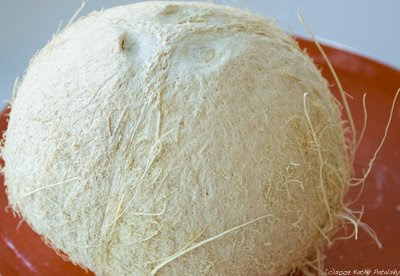 I had never seen a pure white skinned coconut before! So I had to buy one. 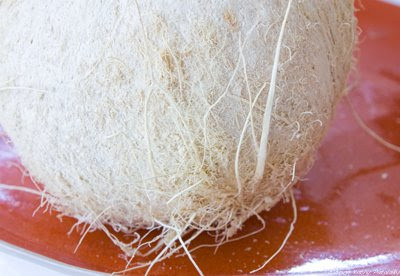 Mysterious Cloud Coconut. I don't know it's official name. 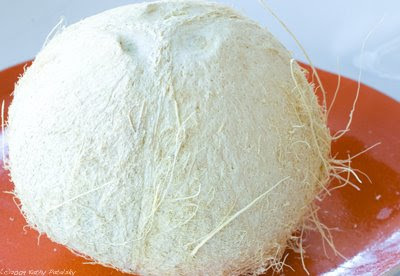 White coconut? I'll call it a cloud coconut. Or angels breath coconut. 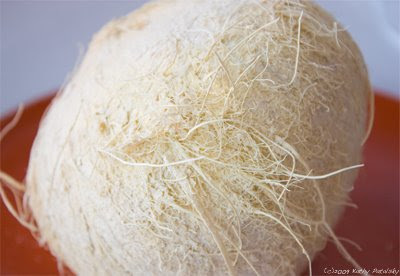 It's so light and pure with its wispy blonde strands gracefully bowing outward. 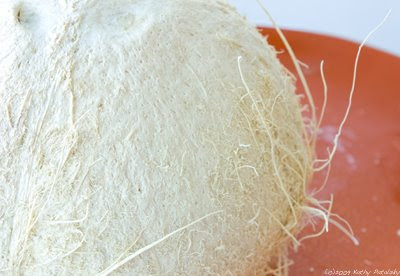 I've been doing extensive research trying to figure out where this exotic white coconut comes from and how it is different from a brown skinned coconut. And unfortunately, my research has left me with a lot of unanswered questions. 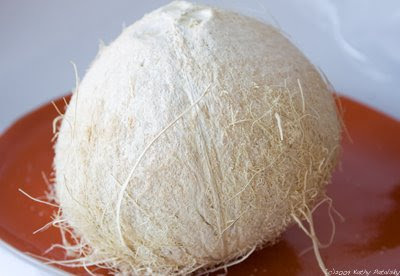 If you google "white coconut" you will get either a pre-skinned Fresh Young Coconut (looks white) or the inside of a brown coconut. Sigh. So check out a few more amazing photos of this mysterious fruit and please let me know if you have any insight to its origin!